The chicken or the egg? The unit plans or the long range plan? I struggled with which post to type up first. I chose to focus on Long Range Plans next because that's what I start with each year. However, you would have to have at least an "outline" of your unit plans before creating your first long range plan. But, I will share my Long Range Plans from LAST year with you. These are my lifeline for the year. Not sure how I ever lived without creating these! 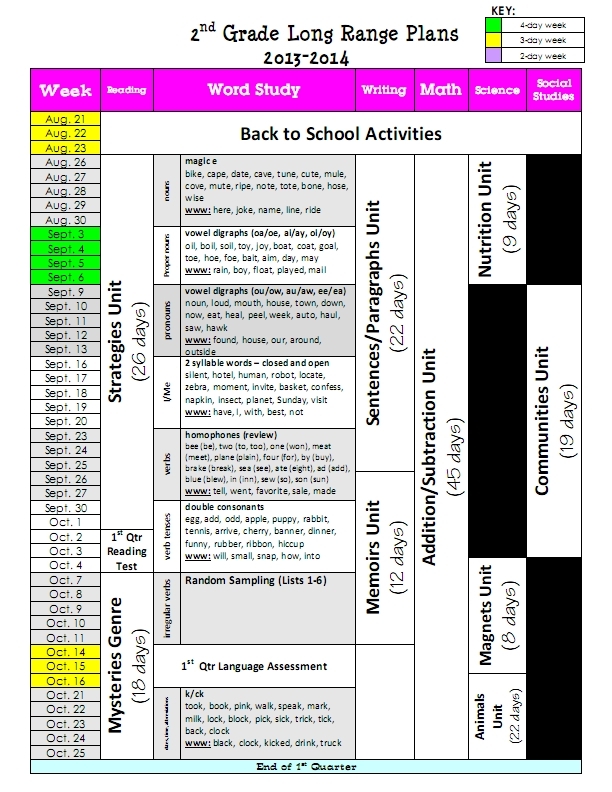 As you can see, I have ALL of my units planned out for the year - how many days I'll spend on each, when I will teach what, etc - there's no more guess work! Of course, this is just a flexible plan and things DO change. If we need more or less time on a unit, that's fine! It happens and I adjust. But, this really helps me stay on track and know what is coming ahead. 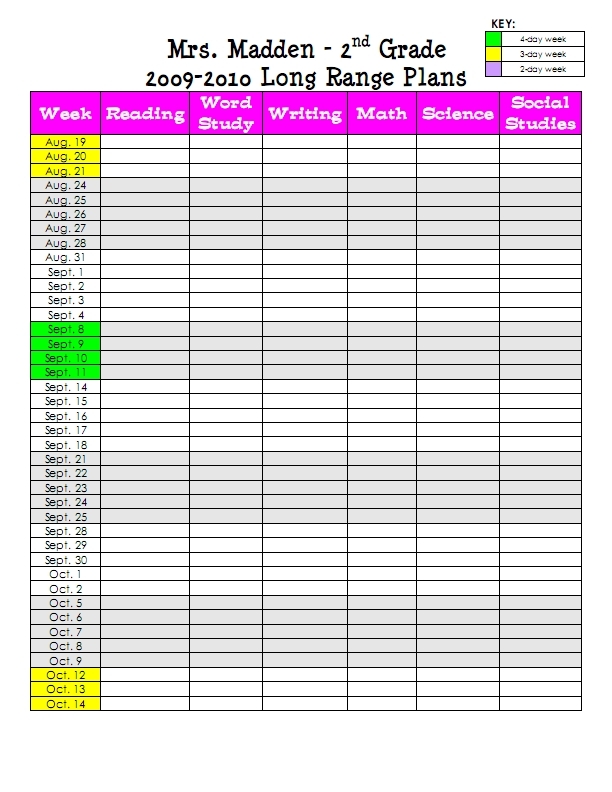 I print this little plan out - fitting each quarter on one-page is a must for this OCD girl - and keep it in the front of my lesson plan binder. I refer to it often to keep myself on track. 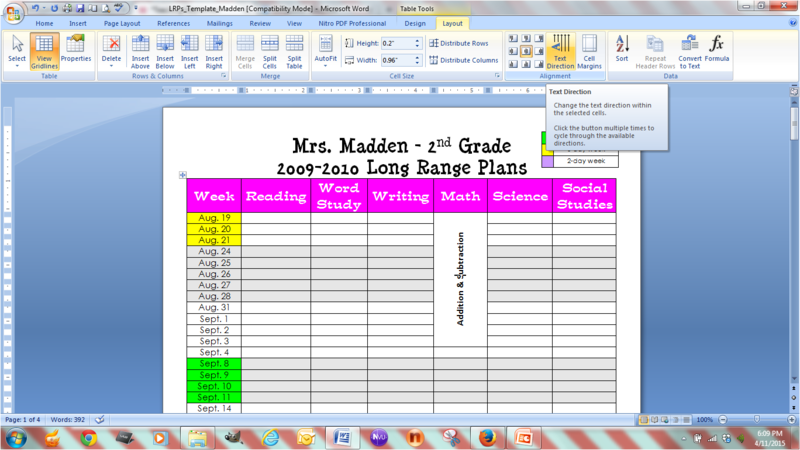 No matter how you end up writing your lesson plans, I would highly recommend creating Long Range Plans for yourself. The more you are planned, the more you can be organized. The more you're organized, the less stress you will feel during the year! 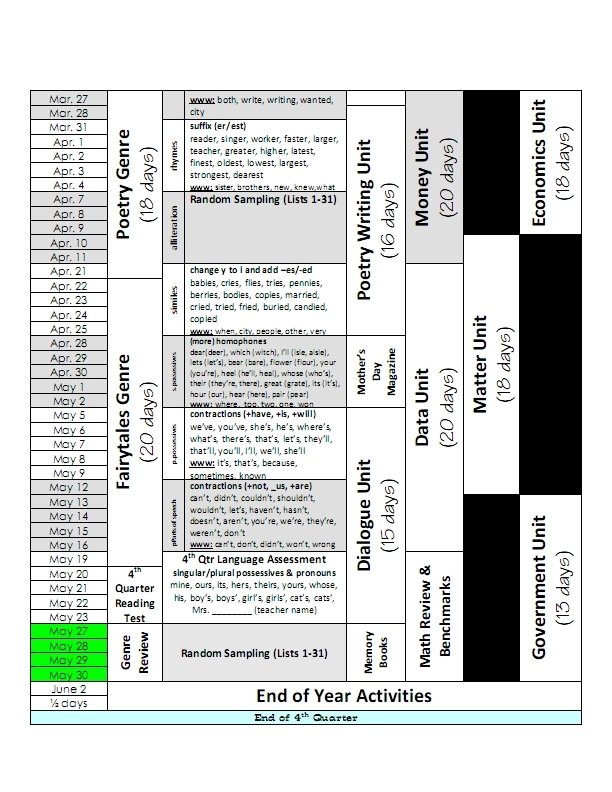 You can download the template that I start with for creating my LRP's each year below. It is a Word document, so experience with resizing and merging table cells will be helpful. Once you download the template, you'll just want to merge the cells to for each unit. For example, if my addition and subtraction unit was 12 days long, I would highlight 12 cells beneath math (see image below) then go to Layout and select Merge Cells. Once I have the cells merged, then I would be ready to add my text. I would simply type the text I wanted there and then change the direction of the text (see image below) by clicking on Layout and then Text Direction. I hope that this post (and/or template) is helpful for you in thinking about Long Range Plans. Seeing your year planned out ahead of time is a lifesaver and will really cut down on your stress during the year! 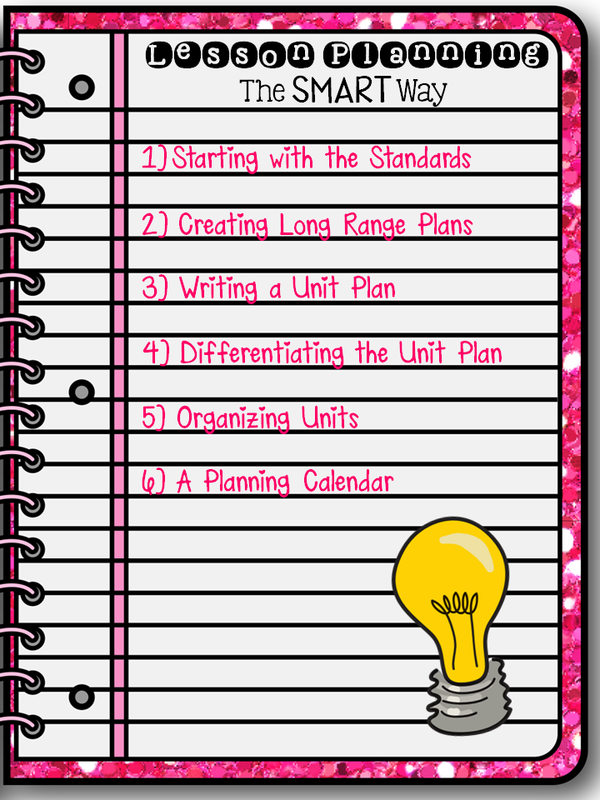 I'll see you again next week for Writing Unit Plans! 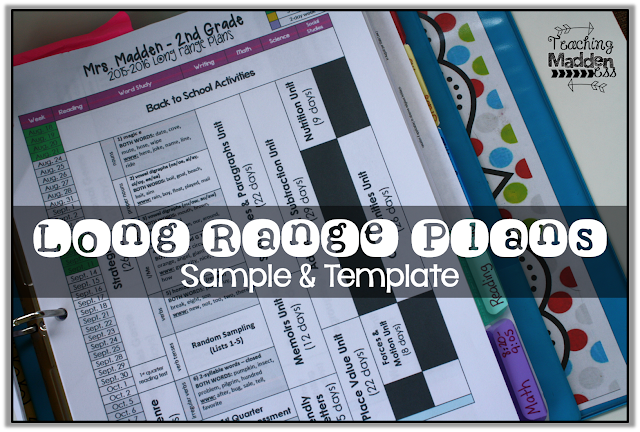 ** Update** Click HERE to download my 2015-2016 Long Range Plans. UPDATE: For future templates, starting with the 2016 school year, simply search for the year in the search bar on my blog. I just wanted to echo Taylor's comment above- also a thankful first year teacher here! This is amazing! Let the year long planning for next year begin! Hey Amanda! I love this concept, and when I taught first grade, my team was totally on board and we hammered this out. Now I am finishing up my first year in second grade and hoping to do the same thing. 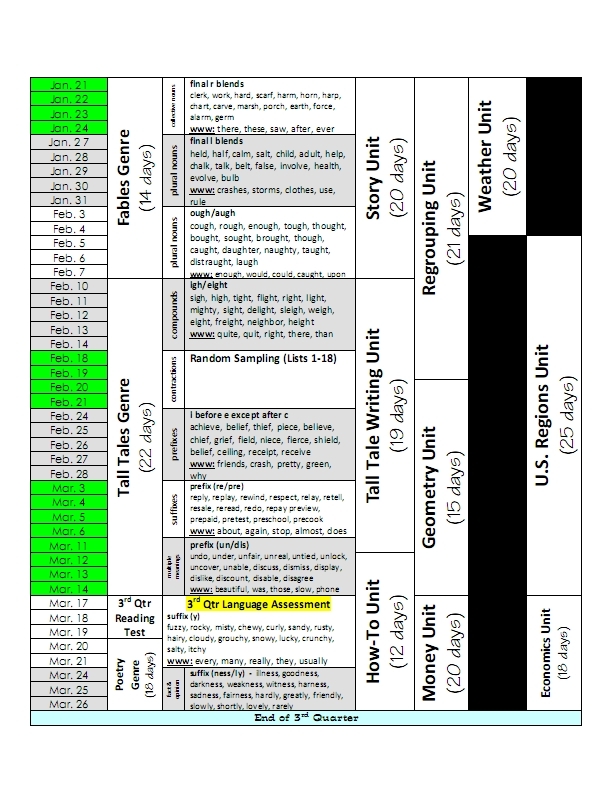 However, I am struggling with getting the same buy-in and organizing the information from my district's curriculum maps. Any advice? Do you have a copy of a 2015-2016 template? Also, we are facing a possible strike this year (really hope not!). I've been working on my units and now I'm debating whether to wait to start with this or just do it and hope for the best. So, with that said, how near impossible is it to un-merge in case I'd have to change things around because of dates? Thanks! I don't! I'm the WORST about forgetting to save when I've just plugged in the new dates, so I only have it saved in the final version. It is pretty near impossible to make changes once this format is completed - unmerging is not nice at all! :( I would probably wait until you know for sure! I wish you were a first grade teacher. I'm going back to the classroom due to budgets cuts and I'm feeling like a first year teacher right now! So stressed! I love your blog and this series has changed how I plan! 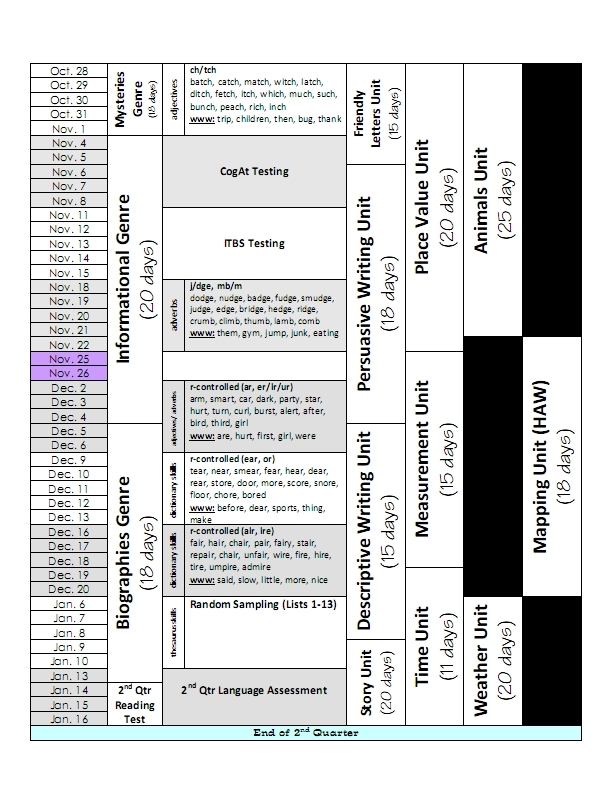 I'm working on my plans right now and I am wondering what language assessments you give in SC? Thanks! I am switching schools and will be teaching a 3rd/4th combo class so it will be essential that I am organized! Quick question, I want to change the quarter ending dates and I want it to look like yours (blue tint, no cells). How do I do that? 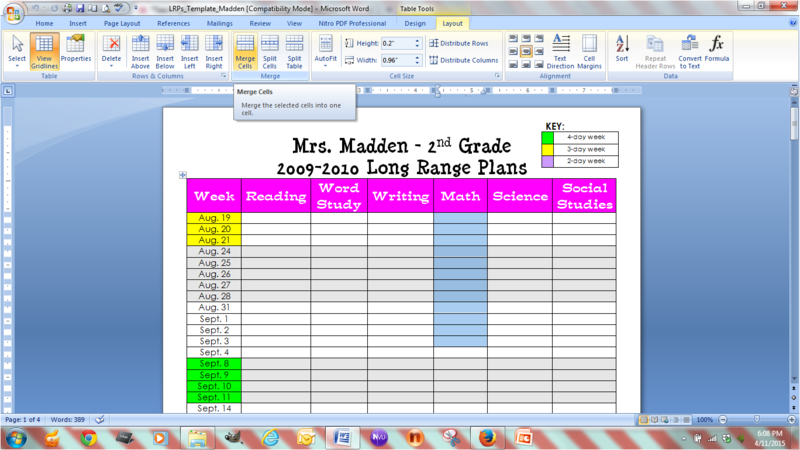 I am working on my year long plan right now using your format! I really like it but I am having one problem. When I rotate the text to 90 degrees, it disappears. I googled this problem and what I found out is that even though it isn't showing up in the box, it is actually there when you print. So when I do a print preview I can see it. However, not seeing it while I work is really difficult. Just wondering if you had this issue or not? I am using Microsoft word 2011 version. Love it! Even as a veteran teacher, this is helpful to me! I d/l'd the word template! Thank you! Thank you, thank you, thank you! Our fourth and fifth grade team just sat down and mapped out our entire year thanks to you. This resource is invaluable and will make life a lot easier come the beginning of the year.